Why FPGA boards are so expensive? When looking for an FPGA board, I was really surprised to see that they are quite expensive. At first, I thought that the FPGA was the most expensive part (it is) and that the rest was just a simple carrier with some connectors on it. It is more or less the case for low-end cards, but I quickly discovered that the price of FPGA dev kits is always about twice the price of the FPGA they sport. So, a 40€ FPGA will be soldered on a 40€ carrier to make a 80€ dev kit, and a 250€ FPGA will be installed on a 250€ carrier to make a 500€ dev kit. My question was: why? Why do we pay so much for development kits on which expensive FPGAs are installed (for some definitions of "expensive", there are dev kits out there that cost more than a car). I started to do a bit of research to try to discover where this price comes from. In this blog post, I show all the information I got. If you are only interested in the conclusion, feel free to jump directly to it. In short: the price is plenty justified! On Digilent boards, going from an Artix 100T to 200T adds 191 € to the price, even though the 200T FPGA is only about 70$ more expensive than the 100T FPGA. When looking at ratios, the Nexys Video is 1.6x the price of the Nexys 4 DDR, and the Artix 7 200T is 1.6x the price of the 100T. What is around the FPGA must therefore scale at the same rate as the FPGA itself. The Trenz micromodules are available at a very good price, but the carrier boards seem ridiculously expensive! Paying more than 200€ for an HDMI port, two LEDs and an USB-to-serial chip does not seem justified. The price of components are obtained from Digikey (in dollars). When possible, I take single-unit prices. This allows me to have an idea of a price that Digilent may make us pay for the component (instead of what they paid), and this takes into consideration that Nexys boards are not the highest-volume product of the century. FPGA fans are quite rare, and FPGA fans willing to spend 500€ on a card are even rarer. Now, let's start with the shiny stuff. In this section, I show the price of some components found on the Nexys Video board (prices from Digikey, obtained on July 4th, 2016). How much do we pay for the OLED display or the audio chip that we may not use? This section answers that. 512MB of 800 Mbps DDR3 RAM is available on the Nexys Video. The exact part used (as seen on the schematics published by Digilent) is a MT41K256M16HA-187E at 8.13 USD. 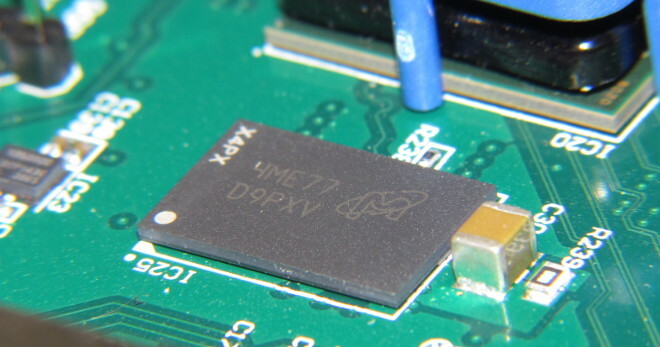 The chip on the picture above looks like a RAM chip (it is quite large, has a ball grid array package and is close to the FPGA) but does not have any meaningful markings. However, it is identified as IC25 on the board, and the schematics say that the RAM chip is soldered at this location. The Ethernet port of the board is controlled by a Realtek RTL8211E PHY at about 2 USD. The HDMI ports are driven by an AD8195 buffer chip at 4.39 USD (sorry, I forgot to take a picture of this chip). A PIC microcontroller gives a bit more body to the Nexys Video board and makes its use simpler. Basically, it manages the FPGA. When the board is booting-up, the microcontroller programs the FPGA from an USB drive or SD-card (FAT32 format, selects the first .bin file it finds in the root directory), or let it program itself from the QSPI flash device or a JTAG connection. Once the FPGA is programmed, the microcontroller changes mode and acts as a PS/2 device. We can plug an USB mouse or keyboard to the Nexys Video and use them as PS/2 devices on the FPGA side. The microcontroller itself, a PIC24FJ128, costs 4.81 USD, but we have to factor in the development cost of the firmware. This is a price I cannot really evaluate as I don't know the development effort required from Digilent, the number of Nexys boards they sell, and plenty other information. The OLED screen is typically something that I didn't need, and I was afraid that it contributed significantly to the price of the board. However, the UG-2832HSWEG04 screen with included controller costs only 3.85 USD. We have not yet found any very expensive part on the board. The various jacks available on the Nexys Video board are controlled by an ADAU 1761BCPZ audio controller. This is a fairly complex and powerful chip that is even able to resample signals, route them and do plenty other stuff. This is like a mini-soundcard, programmable over I2C. The chip costs 11 USD, a hefty price compared to other components. 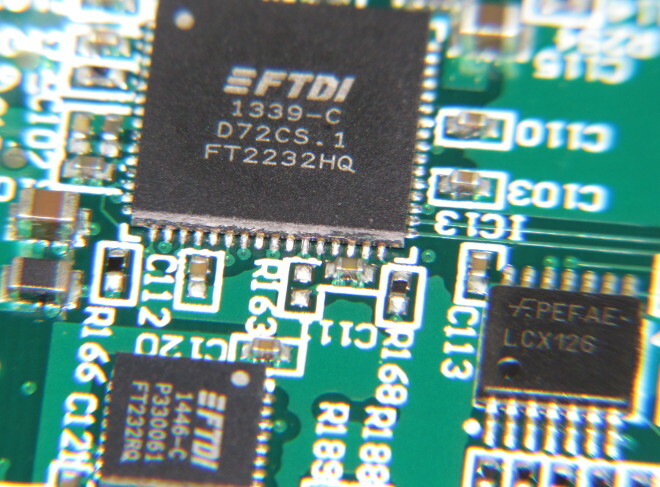 Two FTDI chips are used, a FT2232HQ for a fast USB-to-parallel connection (used by the FPGA itself and as a USB-to-JTAG port), and a FT232RQ for a much slower USB-to-serial asynchronous connection (used by the FPGA when a very simple serial interface is needed). The large FT2232HQ chip costs 6.70 USD, the smaller FT232RQ costs 4.50 USD. The previous section talked about chips and devices that sound cool and provide user-friendly features. They are devices we care about, because adding them adds features and removing them removes features. When summing up their cost, we get 49.24 USD, or about 9.8 % of the price of the board (if considering the American 490 USD price). Now, my research taught me that the devil is in the details, and here the details consist of power consumption. The FPGA can burn as much as 10W (and become so hot that you cannot touch the heatsink anymore), other devices (especially the RAM, the FTDI chips and the microcontroller) also consume several watts together, and everything need a very high quality power supply. For instance, the FPGA core needs between 0.980 and 1.050 volts, at up to 8 amps! Producing such a stable voltage at such high currents is very challenging. Moreover, a dozen other voltages are required (1.0V, 1.2V, 1.3V, 1.5V, 3.3V, 5.0V among others). All the voltages required on the Nexys Video board are produced by a succession of ADP voltage regulators. They are chained or run in parallel, and need to be very efficient. 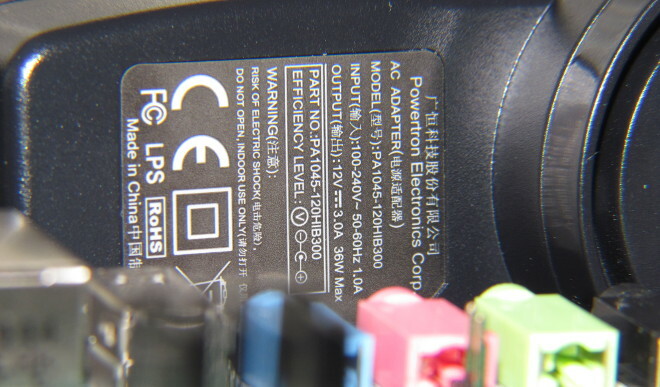 The input voltage (from the power brick) is 12V, and 1V must be produced at 8 amps. A simple approach that dissipates the "excess voltage" as heat would not work, as about 88W would be needed for that apprach (losing 11V at 8A). This is more power than consumed by a high-end Intel CPU! To that, we have to add high-quality and large capacitors, and 1% tolerance resistors. I did not find the exact reference of the resistors, capacitors and inductances used, but it seems that they are worth at least 10 USD. We tend to forget that, but printing PCBs is quite expensive. 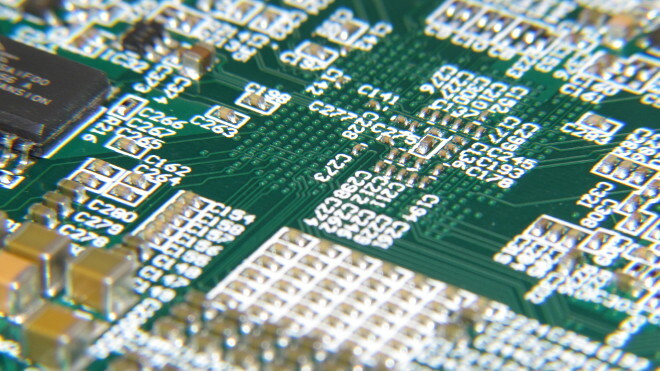 Moreover, we are not talking about a simple one-sided PCB printed at a low-cost factory. 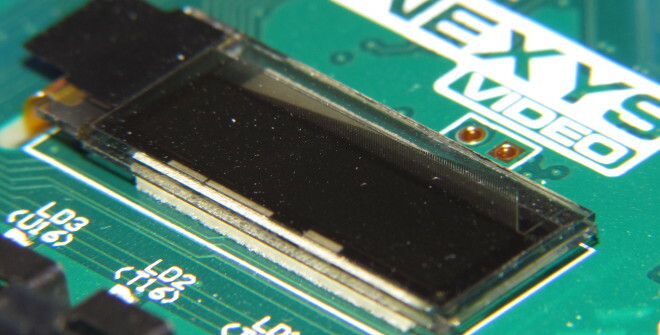 As seen on the picture below, there are many traces, many vias that are really close to each other, and routing likely requires the use of several PCB layers. To give an idea, the default Power Analysis configuration in Vivado assumes that 12 to 15 PCB layers are used. This is absolutely huge! I cannot really extract much information from the above image as I'm not (at all) a PCB designer. For instance, I don't know if each darker line indicates a separation between layers. I assume that the lighter portion of the image comes from when the PCB was cut, but I don't really know. For what I see, there may be around 8 layers in this PCB. After a very quick research, it seems that an 8-layers board the size of the Nexys Video would cost about 30 USD in 500 unit batches. But as with software costs, only Digilent knows how much the PCB costs. The power supply shipped with the Nexys Video board is able to output at most 36W at 12V, 3A. One day, I let it plugged in the wall overnight, with the board shut down (so, no load on the brick). The next morning, the brick was completely cool. I became curious and loaded a very power-hungry design on the Nexys Video board. The FPGA became really hot (it reached 73 °C, 163 °F), the various voltage regulators slightly warm, the RAM quite warm too. And the brick was still completely cool. It seems that Digilent really paid attention to the power delivery system of the Nexys Video board, spending about 40 USD on on-board voltage regulators, and using a very high quality power supply that remains cool whatever happens. To give you an idea, my laptop consumes about 9W at idle, and its power brick (from Dell) is a very nice hand warmer. When the Nexys Video consumes the same amount of power, its power supply remains completely cool. Based on what can be seen on the above picture, I have found a very similar (if not identical) power supply on Amazon for 15 USD. Here is a very small section in which I point out that designing a board does not simply consist of buying and soldering components. The components must be carefully chosen, the PCB must be place and routed, the microcontroller firmware has to be developed, along with Vivado programming drivers (and the Digilent Adept suite that can also be used to program the FPGA). Designing such a board may require several years, several failures and adjustments, and represents a large investment for a very small user base. Here, I talk about Digilent, but the same is true for other brands. In fact, there is no bargain FPGA board on the market. Nobody managed to produce an Artix 7 200T board at 250$ (the consumer price of the FPGA plus some headroom). I also know some people that decided to build their boards themselves, but they finally took several years to do so and spent more than the price of an already-existing board. This blog post evaluates the price of the components on the Nexys Video to 352.72 dollars (which is a very, very, very rough estimate). This explains about 70% of the price of the board (490 USD on the Digilent website), the rest being engineering costs, return on investment, software and maintenance costs, etc. What is interesting to see is that the shiny stuff represents only a very small portion of the costs (less than 10%). A large portion covers the power supply, which was a very big surprise to me. For what I know, larger FPGAs consume more power than smaller ones (and we also tend to want more shiny stuff around expensive FPGAs). This may explain why the ratio between the price of the FPGA and the price of the board remains constant: the beefier the FPGA, the most expensive the power delivery system. Also, a larger FPGA has a larger package, with more pins, which requires more effort when making the PCB (routing, metal layers, etc). This, for me, also explains why FPGA dev boards are so expensive. But are they? When looking at the parts list (that does not count all the resistors, capacitors, buttons, LEDs, connectors and screws available on the board, nor the packaging, human costs, etc), I get the feeling that I paid less than I should have (especially since the Nexys Video is on sale on Trenz Electronics). At the end, all those FPGA boards from all those brands do a very nice integration job, and feel finished, polished, well built (the PCB is sturdy and feels luxurious), and some of them even have cases and fans! A couple of days ago, I presented a small VHDL project that allows to exchange data with an FPGA over a fast USB link. The goal of that post was to present some difficult-to-find information about the FT2232H chip, and a simple project that allows to benchmark the resulting USB connection (results show that 14 MB/s are possible using that chip). In this post, I go a bit further and present an USB to AXI master bridge that I developed to test various AXI slaves on the Digilent Nexys Video board. This project can be compared to the Xilinx JTAG AXI master IP, but has the advantage of being simpler to use (using a small and portable C tool instead of Vivado commands). Last post introduced the Nexys Video board and what features it has, and presented the FT2232H USB-CDC chip that allows a microcontroller or FPGA to easily communicate with a computer over USB. In this section, I give more details about the AXI bus, used in the industry to connect various devices on a SoC, and the Xilinx Vivado IDE used in IP mode. AXI is a bus protocol developed by ARM, that allows devices to communicate using addresses and data. At the most basic level, an AXI bus is a link between one master and one slave. The master initiates transactions (read/write data at a specific address), the slave responds to them and provides data. A typical AXI slave is a memory controller, that takes addresses and data to read/write to memory and performs these operations. The most common AXI master is a microprocessor, that initiates memory transactions according to the program is executes. On paper, the AXI bus seems limited, as it only describes one master and one slave. However, the devices themselves can be much more interesting than a simple master or slave. A device may have several master ports (instruction and data ports, or two independent ports that allow to bridge two AXI networks), several slave ports (a memory controller taking instructions from different masters), or a mix of master and slave ports (a powerful AXI router that redirects master requests to the proper slaves depending on their addresses, with arbitration if different masters want to access the same slave at the same time). Other AXI devices include clock domain crossing devices (a fast master is connected to a slow slave, for instance), bus width adapters (a master reads/writes 32-bit chunks of data while the slave uses a 128-bit bus, which requires several master transactions to be merged before being sent to the slave), etc. The following figure shows an example of a set of AXI devices that have been connected in order to provide an interesting system: a fast Microblaze processor is connected to a memory cache, connected to a memory controller; a slow Microblaze processor (running at half the speed for instance) is connected to clock adapters then to the memory cache. Logic circuit development can be split in two parts: implementing the interesting stuff (and their testbenches), and wiring everything together. This last operation requires much copy/pasting, is tedious, and can introduce subtle errors in the design, for instance mis-matched clock periods, difficulties to know whether "data_to_send" goes from or to the device currently being wired, etc. Most FPGA or ASIC IDE providers have solutions to this problem, and they nearly all consist of allowing the user to graphically wire boxes. Each piece of the design is a box with input and output ports, and lines can be drawn between the ports. This produces a very nice schematic and allows to quickly see the entire design. Once this wiring is done, a VHDL or Verilog file is generated for use with standard synthesis and simulation tools. In Xilinx Vivado, schematic entry requires the use of the IP Integrator perspective. Xilinx heavily focuses on this IP Integrator and provides plenty of components ready to be used. In fact, most of their example designs now consist of integrating a couple of components with a Microblaze processor, so that people don't have to enter VHDL code anymore. This opens a blank sheet on which you can add components (called IP, for Intellectual Property I think) and wire everything together. The tool is very powerful and really tries to prevent you from making errors. For instance, each port has a type and additional information, so that Vivado can detect when you connect ports from different clock domains together. It also checks that your AXI parameters are correct (bus widths match, for instance). If you right-click on the blank sheet, a menu allows you to add some IP provided by Xilinx (or by you, you can create your own IP even if I will not describe that in this blog post), or to add any of your VHDL or Verilog modules (Add Module..., your file will appear as a box with input and output ports). Some Xilinx IP propose nice automations. For instance, adding a Microblaze microprocessor, then clicking on "Run component automation" in the green bar that appears, will add plenty of other components to that you get a complete and functional Microblaze SoC, with memory, debug and some AXI infrastructure. Because you can add your own RTL components in IP Integrator, you can wire up your design in this tool without having to create IP packages or use any Xilinx IP. However, I recommend that you look at some Xilinx IPs (more details about them can be found in IP Catalog, in the sidebar). There are complex stuff, like video, image encoders and network stacks, but also very handy basic things like memory caches, multipliers and dividers, AXI-to-nearly-anything bridges, etc. The goal of this project is to design an AXI master that issues transaction based on an USB connection in the simplest way possible. The AXI protocol is quite complex and supports many features, like burst transfers (sending the address once, then several data packets), partial writes, cache coherency signals, memory protection (the master says whether it is in privileged or unprivileged mode), etc. However, I don't implement any of these features, only the strict minimum for testing. Burst transfers are not really needed as USB is much slower than even the slowest memory device. The computer sends an address encoded as 4 bytes, little endian. The MSB (bit 31) is set to 1 when writing, to 0 when reading. No error management is used, the protocol is the absolute minimum required for testing AXI slaves and memories. Because the FTDI chip has read and write buffers, the protocol can be slightly optimized for free. When writing, the computer can send a bunch of addresses and data packets at once (every data packet must follow its address). When reading, the computer can send a bunch of addresses, then read a bunch of data packets. Beware that the addresses sent to the FTDI chip must fit on its read buffer (32 work, 64 is unreliable). If too many addresses are sent, the buffer may become full, which may block the computer and prevent it from reading data. The computer waits for the address buffer to become empty, the FPGA waits for the computer to read data, and we have a deadlock. I have implemented the USB-to-AXI master component as an IP, that can be imported and used in Vivado. You can download the IP here. The hdl/ft2232h_mem_v0__1.vhd file contains the actual component and can be used under the GNU LGPLv3 license. Other files are generated by Vivado and I don't really know what their licenses are. I advise you to extract the VHDL file and re-build an IP if you need to use it for something else than experiments. The AXI bus contains many signals and four independent communication channels: read addresses (from master to slave), read data (from slave to master), write addresses (from master to slave) and write data (from master to slave too). An AXI master can send as many read/write addresses on the address channels as long as the slave is ready. When the master wants to read data, it sets its ready flag and reads from the read data channel. The master can also write data on the write channel as long as the slave is ready. This is a bit weird, but as long as transactions are kept in order, you can send a bunch of data, then a bunch of write addresses (at which point the slave will perform the write operations). The only thing you must keep in mind is to send read addresses before reading data (seems legit). There are many states and nearly no parallelism, but this is to keep things simple (for instance, the component could have read data from USB while the write address is sent to the slave instead of waiting for the slave to accept the address before reading data from the USB bus). The Nexys Video board provides a very stable 100 Mhz reference clock to the FPGA. The Memory Interface Generator needs a 200 Mhz input clock, that must be produced. I decided to use the 100 Mhz reference clock as base clock, not the 60 Mhz one, because memory interfaces are quite sensitive to clock signals (jitter, duty cycle) and I don't think that the primary goal of the FTDI chip is to provide a rock-solid clock. The MIG is very easy to configure if you properly configure your project for your board. Digilent provides board files for all its boards, and these files describe the precise timings and parameters of the onboard DDR RAMs, if any. They also provide the complete pinout of the FPGA, which allows you to add a memory in a single click (running a board automation). The MIG produces a ui_clk, a 100 Mhz clock that it uses to drive its AXI slave port. This means that the USB-to-AXI IP (60 Mhz) and MIG (100 Mhz) run at different speeds. An AXI clock converter is therefore needed. In simple cases, reset is easy to handle, just use a switch (beware that most resets are active low, the switch must be set to 1 for the device to work). However, clock generators are a bit more difficult to handle as we have to wait for their clocks to become stable before releasing reset. In this design, there are two clock generators: the one that produces the 200 Mhz clock and one generator internal to the MIG. We therefore need two reset logics, one that releases its reset when the 200 Mhz clock is stable, one that releases it once the MIG can be used (when it has been calibrated). All in all, quite a number of components are required. Here is a large image (I recommend that you right-click on it and see it outside this page) that shows all the components I used and their connections. For my experiments, I've set the AXI bus widths to 128 bits, so that more data can be send/received for each address. In this image, I send a number of output signals to the LEDs available on the Nexys Video board for debugging purposes. If you do the same, you will be able to see that the MIG needs nearly half a second to complete its calibration, which may contribute significantly to the startup time of a microprocessor-based system. The program can be used to write to memory locations (ftdi-axi-master w filename.dat address) or to read from memory location (ftdi-axi-master r filename.dat address size). Addresses and sizes can be expressed in decimal, octal or hexadecimal form (with the 0x prefix). When uploading or downloading, the program starts by initializing the FTDI chip in Synchronous FIFO mode, the mode expected by the FPGA and that provides the best performance. My previous blog post explains the process and tells you what to change if you own a board for which the FTDI chip has a different major-minor USB number. The actual uploading process consists of sending a list of addresses and data to the FPGA. The data width is configured at the beginning of the C file and must be adapted to your AXI bus width. Because sending packets over USB is slow, large packets should be sent. The program packs 1024 addresses, 1024 data words, then sends to whole over the USB bus. This allows data to be sent at over 14 MB/s (when addresses are counted, we should be over 17 MB/s, or 136 Mbps). The download process is comparable to the upload process, with the exception that the program only sends addresses (no data), and receives data. We need to be careful while doing that, as the FPGA answers to read addresses one at a time, and will not read following addresses until the answer has been transmitted. 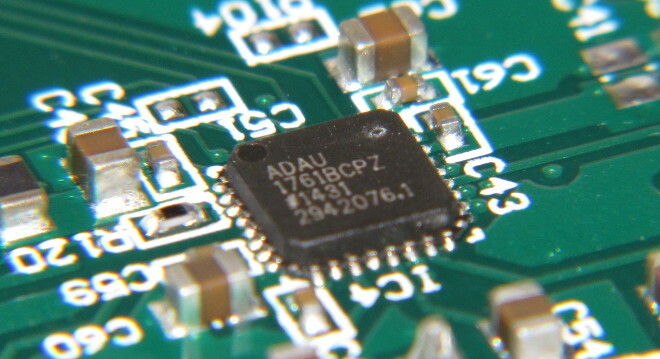 We must therefore ensure that the FTDI send buffer is always able to receive data, in order to prevent deadlocks from occuring (if the computer sends too many addresses and waits for them to be consumed, but the FPGA is waiting for its send buffer to become empty and does not read any address). Fortunately, in my experiments, it appears that using asynchronous USB transfer works and is not too slow. The program fills an address buffer, sends all of them asynchronously, reads all the data asynchronously, and libftdi ensures that information flows without deadlocks. Doing so allows libftdi to make the most out of the buffers available on the FTDI chip, which reduces USB transfers and allows data to be read at a bit under 1 MB/s. This is much slower than writes but still much faster than RS-232. A better protocol (send one read address and a size, then read everything) would make things much faster, though. There is a bit of copy/paste in this code, which I don't like, but it works for its purpose. Note: Even though I'm able to transfer large files using this program (a 70 MB video file, archives, etc), it sometimes happen that the file read from memory starts with 16 random bytes. If that happens, resetting the board, re-writing and re-reading solves the problem. I don't know where it comes from, probably stray data in the FTDI buffer when writing or reading files. Over the past years, I developed a strong interest for logic circuit design and VHDL coding, in addition to computer programming and Artificial Intelligence. In this blog post, I present a small project that consists of exchanging data to and from a Digilent Nexys Video FPGA board and a computer using an USB 2.0 link. Instead of implementing a whole USB stack or relying on a slow RS-232 connection, this project uses the FT2232H chip available on the Nexys Video to exchange data at more than 14 MiB/s. First, a bit of introduction. 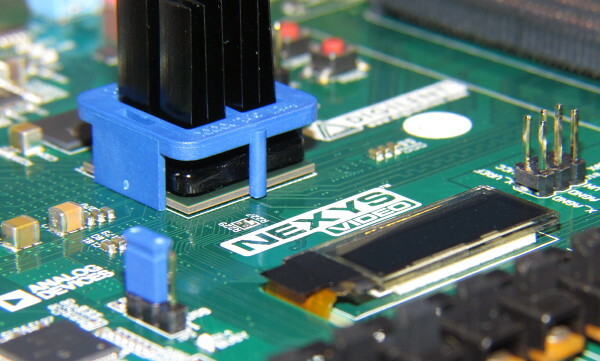 The Nexys Video is a development board featuring a Xilinx Artix 7 200T FPGA, the largest Artix FPGA (and therefore the largest no-too-expensive Xilinx FPGA). 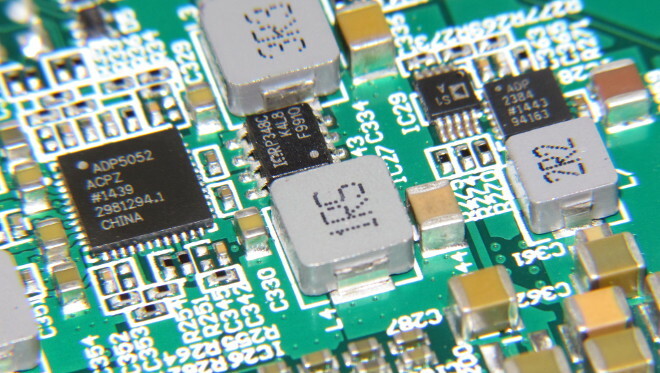 The FT2232H chip is available on many boards (especially from Digilent, but possibly also from other brands), which makes this project quite general. Moreover, I never use any digilent-specific tool or peripheral in this blog post. Plenty of other FPGA development boards exist, some of them much less expensive, but I needed the large 200T FPGA for a personal project. The Nexys Video also has very interesting features, like an HDMI sink (for video acquisition), gigabit Ethernet (so, you can acquire video and stream it on the network if you want), DDR3 memory and a nice amount of controllers (Ethernet MAC, audio chip, and a microcontroller that allows the FPGA to be programmed from a USB thumb drive or a SD card, in addition to JTAG-over-USB and QSPI). The FT2232H chip allows a device to send and receive data over a USB connection is many different ways, the chip being highly configurable by writing values in a small EEPROM memory or by configuring it directly over the USB connection. It is most often used as an UART-to-USB bridge, that allows microcontrollers and FPGA to very easily communicate with a computer. However, serial communication with the FT2232H is quite slow, with a top speed at around 1 MiB/s when special care is taken. Fortunately, the FT2232H also has a very high-speed mode, that also happens to be quite simple to use. The FPGA or microcontroller communicates with the chip using a 8-bit bus, and does so at 60 Mhz using a clock produced by the device (in Synchronous FIFO mode). It is also possible to have the device provide the clock to the FTDI chip (Asynchronous FIFO mode, as the FTDI chip samples data on fall edges of specific signals), but this is a bit slower as timing is more conservative in this mode. Enabling Synchronous FIFO mode is bit difficult as it is a two-step process. First, the FTDI chip must be configured in Asynchronous FIFO mode, using either a special USB command or the EEPROM memory. Fortunately, the Digilent Nexys Video board configures its FTDI chip in Asynchronous FIFO mode by default. The Synchronous mode must be enabled afterwards, and has to be so using a USB command. FTDI chips present themselves on the USB bus as modem devices, using the USB CDC class. On Linux, the FT2232H chip exposes two devices, /dev/ttyUSB0 and /dev/ttyUSB1, one for each channel (the chip allows two devices to be connected to it, a JTAG programmer and a general-purpose connection on the Nexys Video). On Windows, COM1 and COM2 are available once a driver is installed. Opening /dev/ttyUSB0 and writing to it allows to communicate with the device connected to the first port of the FT2232H chip using its default mode, Asynchronous FIFO in the case of the Digilent Nexys Video. However, there is now way to enable Synchronous FIFO using only this ttyUSB0 device, we must use libftdi. libftdi is a pure user-space library, built on libusb, that allows to detect FTDI chips, configure their ports, send and receive data. This library is very easy to use but has one major problem: it unregisters the USB CDC driver. This means that once a libftdi call is made, the /dev/ttyUSB devices disappear and cannot be used anymore. All the communication with the chip needs to be done using libftdi. In this section, I present a very small program that opens a FT2232H USB device, configures it in Synchronous FIFO mode, receives a whole bunch of data (for benchmarking purposes), then allows the user to type numbers that will be sent to the device. This is not very useful but is a nice experiment, and I used it to turn on or off LEDs on the Nexys Video. First, some includes, that require that libftdi1-devel or libftdi-devel is installed. This library is available in all major Linux distributions and Mac OS ports. It is also available on Windows but I don't have any Windows machine on which to test that. // Open device. You will have to change 0x6010 ! The USB device major-minor numbers can be found using lsusb. Find the line talking about your FTDI device, and look at the numbers that look like 0403:6010 or 0403:6001. Each FTDI device has a different number, and some board manufacturers change the number in order to use their own (if they have their own driver for instance). Now that the device is open, we can configure it in Synchronous FIFO mode. Because the Digilent board is already in Asynchronous FIFO mode, this is very simple as a simple flag has to be toggled. On other boards, more libftdi calls may be required (one more, I think, the one that puts the chip in Asynchronous FIFO mode). I invite you to consult the very nice libftdi documentation for that. The first for reads 32 MiB of data. The second one displays the last 1024 bytes in integer format, so that I can check that the data is as expected (see next section for how to generate this data on the FPGA). In my experiments, data is read at around 14 MiB/s, which means that the FTDI chip is able to use 112 Mbps of the 480 Mbps USB connection. Not so fast but still much faster than RS-232. The only way to go faster is to use the Gigabit Ethernet port of the board, but this is much more complex to put in place (on the FPGA side). By the way, I highly recommend you to visit hamsterworks.co.nz if you don't know this website yet, this is very interesting especially if you own a Nexys Video or Arty FPGA board. That's it for the computer part. Now, the FPGA must be able to communicate with the FTDI chip. The FPGA side of the project is simple and complex at the same time. Simple as the FTDI chip is very easy to use (parallel port, the clock is provided, not too many signals to handle, easy timing). Complex because getting accurate timing information is quite challenging: the FTDI FT2232H datasheet lists timing information on page 41, but the way it is presented is quite misleading. On page 41, we see (when writing) that the clock period of the FTDI chip is 16.67 ns, for a clock frequency of 60 Mhz. We also see that the data that we want to write must be on the parallel bus two clock cycles after the chip told us that it accepts data. However, the timing table tells us that the setup time for the data is 16.67ns, a full clock cycle, and no hold time is needed. This is a quite uncommon way of expressing time. However, we can understand this table and schema in another way: on clock cycle N, the FPGA can sample TXE, the signal that tells us that data can be sent to the chip. On clock cycle N+1, the FPGA must place the data on the parallel bus and deassert WR, the signal that tells the FTDI chip that data has to be written. On clock cycle N+2, the data can be removed from the bus. Seen from clock cycle N+2, we have a one-clock-cycle setup time and no hold time. From what I can see in the datasheet, it appears that the FTDI chip samples and produces signals on falling clock edges, while the FPGA does that on rising edges. This seems very natural but requires that we are careful: the data that the FPGA produces will be sampled 8.335 ns after the rising clock edge, not 16.67 ns. So, don't forget to add an output delay constraint in order to ensure that the FPGA produces data on time. The datasheet coupled with the above paragraphs should allow you understand a simple example. In this example, the FPGA sends data whenever possible, producing an ever-repeating sequence of numbers from 0 to 255. This allows to easily check on a computer that no byte is missing or duplicated. When data arrives, the FPGA copies it to the 8 LEDs available on the Nexys Video. The interface of the VHDL module is quite simple. 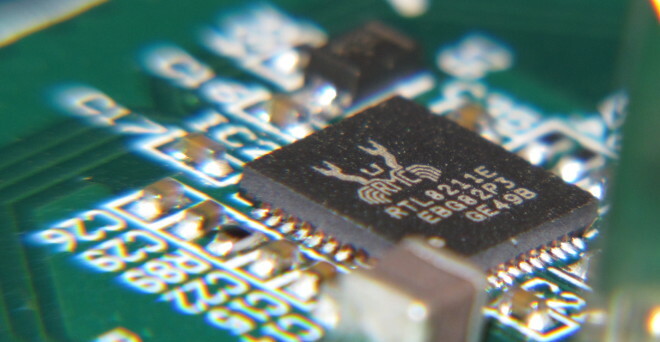 The FTDI chip provides the 60 Mhz clock, an input/output parallel bus, and a number of signals. These signals allow to know when data is available or data can be written. The FPGA can say whether it wants to read or write, and what is the direction of the parallel bus. There is also a very nice signal that allows the FPGA to send a wake-up USB packet, so that you FPGA can wake-up your computer if need be. -- are usually not used in FPGAs. -- SIWU allows to wake-up the computer. The implementation is a simple state-machine. Reading needs two states, one that actually reads the data (and tells the FTDI chip that data has been read), and one that gives one clock cycle to the FTDI chip to update prog_rxen. Writing is a bit more complex as three clock cycles are needed: the first one changes the direction of the data bus, the second one places data on the bus now that the FPGA can drive it, and the third cycle simply waits so that the FTDI chip can process the data on the bus and update prog_txen. -- the FPGA immediately responds to user queries. When dealing with an inout port in VHDL, we must not forget to assign it 'Z' before trying to read from it. On an electrical perspective, Z puts the port in high-impedence (input) mode. On a purely language side, the resolution function for std_logic_vector treats Z as unknown and gives priority to other drivers. If one end of a signal sets it to Z and the other end sets it to 1, for instance, then the signal takes a value of 1. This implementation is very simple and cannot really be used for real-world things. In the next post, An USB to AXI master interface, I present a small IP (and accompanying program) that allows to read and write to arbitrary addresses over an AXI bus. I use it to store files in the 512 MB DDR3 RAM available on the Nexys Video. I'm pleased to announce that the kdev-qmljs plugin that I've developed during the spring and the summer is finally released in version 1.7.0. This version is compatible with KDevPlatform 1.7.0 and KDevelop 4.7.0. You can download the source tarball on download.kde.org. More advanced support for Node.js, richer QML helper tools and some other features will be available in the KF5 version of the plugin. I hope to have time to work on it shortly. The tarball that I linked hereabove is known to compile and work on Fedora and a preliminary package has already been created (the final one will come shortly I think). Thanks again to everyone who helped me develop this plugin and fix bugs (especially my mentor Sven Brauch, Milian Wolf who dived into the deepest parts of KDevelop in order to fix a memory corruption issue, Kevin Funk and Aleix Pol who gave me advice on how to properly implement some parts of the plugin). Thanks again to the whole KDE community for the support and encouragement, and to the sysadmins who do a wonderful job to get everything working. I've not blogged for nearly a month, but it does not mean that nothing has happened. I'm quite busy with university stuff (more on that later), but here are three things that may interest you. Dolphin has supported Baloo for a very long time and is able to display semantic places like "Today" and "This month" in the right-hand box that lists your preferred folders and your drives. It also allows you to perform simple queries that consist in looking for files containing specific words. Note that we are in September 2014 and all the results are from August 2014. There is not result before or after August 2014. Some bug fixes were needed for Baloo to work properly with Dolphin, and they have been pushed upstream (in the now KF5-based master branches of kde:baloo and kde:baloo-widgets). The patch to Dolphin that makes it use the query builder widget has been pushed to the frameworks branch of kde:kde-baseapps. The KDE sysadmins installed Juvia (implemented in Ruby) and set up a database. I also opened an Akismet account for the comments (Akismet is an automatic spam filtering service). 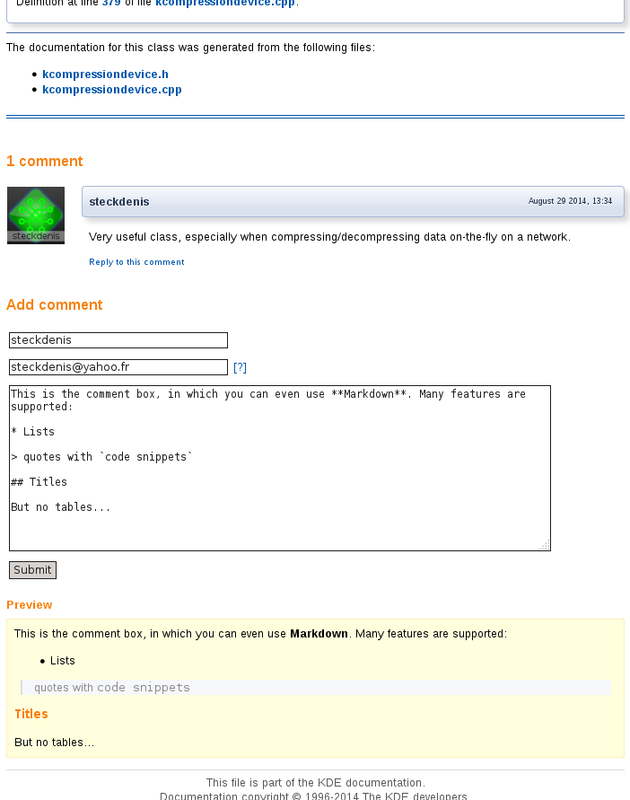 Last but not least, the api-comments mailing-list has been created, and I invite the maintainers of Frameworks appearing on api.kde.org to subscribe to this list so that they are kept informed of the comments. The comments are not yet on-line (I'm waiting for a final "ship it" for my review request), but will hopefully be soon. Working on this gave me the chance to work with the sysadmins, and they are very friendly and very competent people! Hats off to them! One last thing that I've done at the beginning of September is preparing kdev-qmljs for a release. This is not yet an official release because KDevelop 4.7 (and KDevPlatform 1.7, on which kdev-qmljs depends on) has not yet been released. Once this is done, I'll ask packagers to test my release tarball, because it is the first one that I make and I don't know if everything is correct. By the way, if you have an installed KDevelop 4.7 from Git, don't hesitate to test my tarball (check that it compiles, installs and that the unit tests pass once it has been installed). Now, some words about the future. In Belgium, the university starts on September 15, next Monday. This means that I will have to attend the lectures and to work for the university. Moreover, I'm entering my fourth year, the first year of Masters. At the end of my fifth year, I will have to present a thesis (also named memoir, but I don't know which word is the most correct or clear). This is a bit more personal, but I'm preparing my thesis for several years now. I worked on pattern recognition in human writing more than two years ago and finally implemented the Baloo query parser as a pattern matcher. I've also written a paper about my experiments on very fast memory-mapped persistent data stores. Everything works for a moment (I consider the Baloo query parser a success, it parses correctly anything thrown at it) but collapses once I attempt to do more complicated things. If the subject collapses at one time, I would prefer it to do so as early as possible so that I can work on something else and still get my degree. This is the reason why I've been working on it for so long. I need to be sure that I will end up with something working and interesting before committing to this subject. But things are pretty encouraging so far :-) . In 2013, My GSoC project was about implementing a natural (or "human") query parser for what was then Nepomuk. The parser is able to recognize simple Google-like keyword searches in which sentences like "videos accessed last week" can also be used. 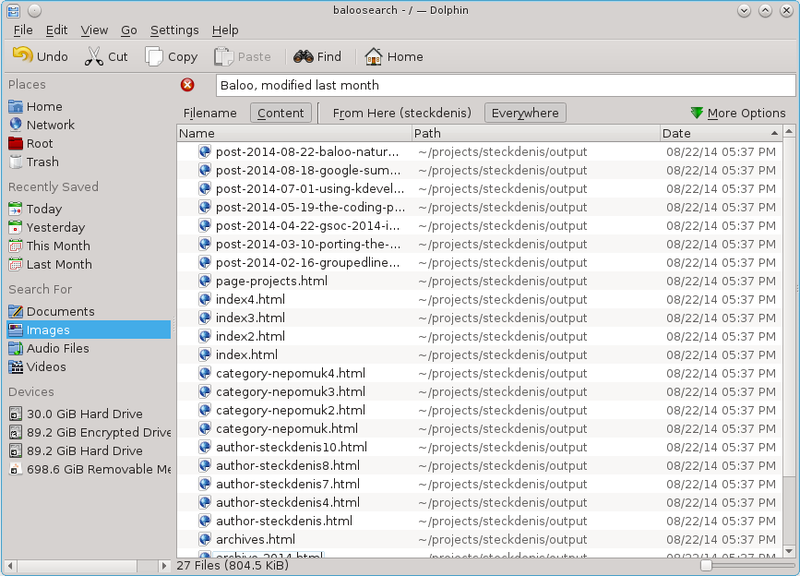 Sample queries include "KDE Baloo, size < 2M" and "files modified two months ago, Holidays, tagged as Important". An explanation of how the parser can extract the advanced information and of which queries are possible can be found here. Since then, many things have happened. First, Nepomuk was replaced by Baloo, and the query parser has been ported to Baloo. Then came the KDE Frameworks 5 and Baloo was ported to them (branch frameworks of kde:baloo). The port went well, but the query parser had been disabled in the KF5 version of Baloo. This week, I have given some love to the QueryParser. First, it was renamed to NaturalQueryParser, because there is another query parser in Baloo (one for simple Xapian queries). Then, I ported it along with the query builder widget to KF5. Finally, I added the possibility to use KFileMetaData to match specific file properties when performing a search. You can now explicitly filter the results of a search by using "width > 300" (the width of an image), "artist contains KDE" (the artist having performed something), etc. The list is independent from Baloo and the query parser does not have to be modified when new properties appear. All of this is currently waiting for being reviewed, but can already be tested by checking out the branch naturalqueryparser of Baloo and Baloo Widgets (kde:baloo and kde:baloo-widgets). These branches are based on frameworks and therefore require the Frameworks in order to be compiled.